The pugster periwinkle buddleia is a dwarf butterfly bush with a compact habit and a full-sized cluster of dense purple flowers. The flowers produce a sweet fragrance that attracts bees, butterflies, and hummingbirds to enjoy the tasty snack they produce. It blooms throughout the summer without deadheading, and the thick strong stems make the pugster periwinkle a very drought tolerant bush. It will also survive harsh winters in zone 5 better than any other dwarf varieties. It grows to about 24 inches, is deer and rabbit resistant, and the variety you need for landscaping, edging, ground cover, or mass planting. It is also great as a border plant, container plant, or a focal point. 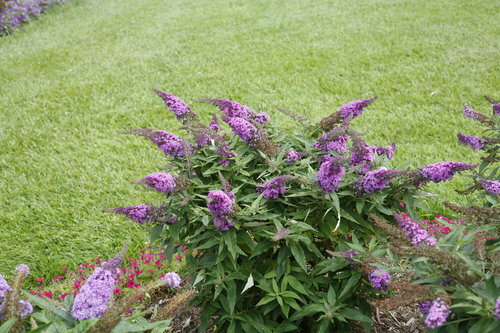 This dwarf butterfly bush does not require a lot of water, and therefore needs soils that are well drained. For maintenance, it is recommended to prune it in spring after a new growth emerges. We offer other companion butterfly bush shrubs including other Pugster Buddliea varieties such as the Pugster Blue. Complete the Pugster group with the Amethyst Butterfly Bush and the Blue Butterfly Bush. Pugster Blue Buddleia is grown in a quart size pot. Orders shipping to CA and AZ addresses may be bare rooted and root washed before being prepped for shipping.